Build New World: Kamen Rider Cross-Z Second Trailer Released! Toei has released a new full-length trailer for the upcoming V-Cinema project BUILD NEW WORLD: Kamen Rider Cross-Z! With the battle for Pandora’s Box concluded, Kamen Rider Cross-Z has returned to his normal life. But when a sinister new foe named KillBus appears, the Kamen Rider War must start again. To overcome this all-powerful opponent, Cross-Z must make a deal with a devil- to gain the Muscle Galaxy FullBottle and become Kamen Rider Cross-Z EVOL! Build New World will receive a limited theatrical release on January 25 2019 followed by a proper DVD/Blu-Ray release on April 24, 2019! 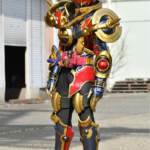 Rabbit/Dragon, the final form debuting in the final episode of the series, has yet to be seen in a properly clear photo, as it’s still under the photo ban. The Hokuto Three are listed as S.H. Figuarts on their placard, however they do appear to be non-articulated Figuarts Zero’s based on the prototypes shown. They’re definitely quite an interesting release if they make it out to retail eventually. As is we have no confirmed release info for any of these figures. As more information and images become available we’ll be sure to update you in the ongoing Tamashii Nations 2018 discussion thread. Just click “Discuss on the TokuNation Forums” below to catch up on the discussion. Images for this story come from AmiamiNews, and Tokullector. As we approach the premiere of Kamen Rider Zi-O in September, we’re continuing to see more and more images of the toyline for the upcoming show. Today brings us a look at this year’s main “gimmick” line with the first wave of RKF (Rider Kicks Figures). RKF looks to be a general action figure line rather than one truly driven by a gimmick as in years past. The line is composed of characters from across the Heisei Era and will also be featuring power up armors for Kamen Rider’s Zi-O & Gates. 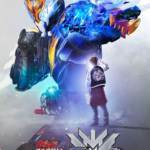 The first wave of releases is dominated by Kamen RIder Build characters including; Build (Rabbit/Tank), Cross-Z, Grease, Evol (Cobra), and the Be The One film exclusive form Cross-Z Build (Rabbit/Dragon). Cross-Z is listed with a 2160 yen price point and October release date, while Evol & Cross-Z Build each bare a 2700 yen price point with November release dates. The first wave of 6 RKF figures are all up for pre-order at HLJ currently. These pre-orders include Ex-Aid Level 2 who isn’t shown in these initial scans. We’ll be sure to keep you informed as more information about this toyline becomes available. Discuss on the Tokunation Forums› Views: 3533 › Credit: @ nesuhero0317 on Twitter! After devastating Mars, the extraterrestrial being Evolt came to Earth seeking to repeat this tragedy. To rebuild his arsenal & powers and become a complete being once again, he would play the long game of manipulating humans to do his bidding. Helping to create Faust, the Rider System, and taking on the guise of Blood Stalk, Evolt has meddled in human affairs for a over a decade. Now, he can also meddle with your collection thanks to the release of S.H. Figuarts Blood Stalk! Blood Stalk sees the return of the well received mold created for Night Rogue with a few key changes to give Stalk his trademark Cobra theme. As ever this mold is nicely poseable and full of personality. But it’s the accessories that really sell it. Thanks to a full compliment of hands, a functional Transteam Rifle, and some new Steam Effect parts. This mold will undoubtedly return at least a third time for Mad Rogue and I eagerly await it! For now though, you can check out our full review and complete 80 image gallery of S.H. Figuarts Blood Stalk after the jump by clicking “Discuss on the TokuNation Forums” at the bottom of this post. We’ll be back later this week with a review of S.H. Figuarts Kamen Rider Lazer Turbo! With every twist and turn, Kamen Rider Build continues to earn it’s place as one of the great series the Kamen Rider franchise has produced. One of the most interesting things about the series has become it’s main antagonist, Evolt. Now, Kamen Rider Evol. As he continues to possess other people and gain new forms, episode 36 finally gave us a glimpse in silhouette of what is to be his ultimate evolution. Today, we finally have our first look at the physical suit for this final form, Kamen Rider Evol Black Hole! 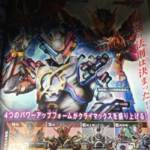 This form has been previously glimpsed only in toy catalog scans back in February These new images come courtesy of @TokuParadox on twitter. Primarily a reuse of the his standard Evol Cobra Form, Black Hole swaps the torso’s primary colors for black & white and features the addition of the Evol Trigger to the Evol Driver. How soon could we see this ultimate evil realized? Likely just in time for Sento to finally gain his Genius form to stop him! Discuss on the Tokunation Forums› Views: 4775 › Credit: @TokuParadox on Twitter! Our favorite toy revealing sleuth is at it again. @_Erasu on twitter has dug up fresh official images of some new upcoming goodies from Kamen Rider Build! First up we have official images for the latest take on the Build Driver (or rather the other way around) the DX Evol Driver! Giving Evolt access to his full powers transforming him into Kamen Rider Evol, this archetype Driver made it’s official debut in this week episode of Build (33). 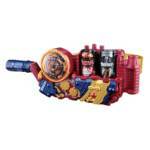 This new roleplay belt includes the DX Cobra & Rider System Evol Bottles. Next we’ve got the DX Evol Bottles Rabbit & Dragon Set! Giving Kamen Rider Evol access to his other two forms (based on our heroes no less!) these new bottles are still fully compatible with the impressive new Evol Driver. As always, these are early release official images. Actual release dates and pricing should be known within the next 12 hours as the Bandai site updates for the first of the month. We’ll be sure to update you, then! New Kamen Rider Build Magazine Scans Online- Introducing Kamen Rider Mad Rogue! The latest round of magazine scans has begun circulating the Internet, giving fans a look at the future adventures of Kamen Rider Build! *The new villain Kamen Rider Evol takes center stage! The EvolDriver unlocks even more powerful FullBottles- the EvolBottles and Kamen Rider Evol alone seems able to tap their powers! Kamen Rider Evol’s default form- Evol Cobra Form comes from combining the Cobra & Rider EvolBottles. Two other Evol forms are demonstrated in these scans- Evol Rabbit Form and Evol Dragon Form! *In a desperate attempt to counter this new threat, Sento dusts off the HazardTrigger once again and tries out another Match- becoming Kamen Rider Build KeyDragon Hazard! Definitely some exciting adventures ahead for Kamen Rider Build! Stay tuned to TokuNation as we keep you up to date on all Rider news! New Rider Joins Kamen Rider Build- Introducing Kamen Rider Evol! Toei has officially uploaded the first full image of the next Kamen Rider to join the adventure that is Kamen Rider Build! 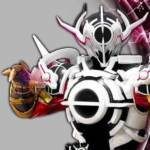 This is Kamen Rider Evol! This mysterious figure uses an incredibly powerful new henshin device called the EvolDriver. While fans have speculated as to the identity of this Rider since toy listings first surfaced, we will leave any further details OFF the frontpage out of respect for the fans who wish to enjoy Build’s saga unspoiled. Kamen Rider Evol will debut in the next episode of Kamen Rider Build! Stay tuned to TokuNation for further developments on this remarkable Rider series! Thanks to recent 3rd quarter toy catalogue scans we have our first look at some of the new forms coming to Kamen Rider Build in the coming months! First up are two brand new forms for both Build himself and Kamen Rider Cross-Z, named Kamen Rider Build Genius Form and Kamen Rider Cross-Z Magma respectively! Kamen Rider Build Genius Form is the titular Rider’s final form, with Sento using the power of unique Genius Full Bottle to harness the power of all 60 Full Bottles. Meanwhile Cross-Z’s new form will see him return to using the Build Driver alongside a new add-on device rumoured to be called the Magma Knuckle. 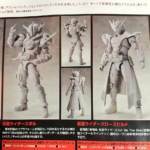 Finally these scans reveal the appearance of yet another Rider – Kamen Rider Evol! 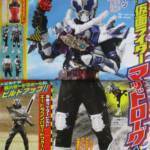 This mysterious new figure will transform using an augmented version of the Build Driver named the EvolDriver, unlocking the more powerful Kamen Rider Evol Black Hole when used in tandem with the EvolTrigger – a new version of the Hazard Trigger. According to the scans, toys for Cross-Z Magma will be released in April, with the Evol Driver following in May before the EvolTrigger and DX Genius Bottle are released in June. Check out the full selection of images after the jump and let us know your thoughts about these additions to the current Kamen Rider series! All times are GMT -4. The time now is 5:50 AM.